We hope that you will enjoy our review of the latest books about costume jewelry. 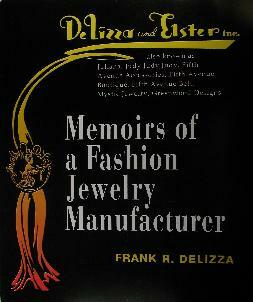 Frank DeLizza�s eagerly-awaited �Memoirs of a Fashion Jewelry Manufacturer� is a beautifully-written, heartwarming story sure to delight anyone with even a casual interest in vintage costume jewelry. A mix of facts, information and anecdotes, �Memoirs� tells the story of DeLizza and Elster Inc., the company that is most often associated in the public mind with the gorgeous jewelry known as �Juliana.� Written in historical order and context, the first chapter begins with the birth of Guillermo (William) DeLizza on <?xml:namespace prefix = st1 ns = "urn:schemas-microsoft-com:office:smarttags" />November 6, 1903 in New York City. The final chapter brings the story, and the New York company, to a close in 1990. In between, the reader will find a wealth of details and rich memories that could only come from Frank DeLizza himself. Original design illustrations, family photos and costume jewelry advertisements are sprinkled throughout the book and allow the reader to become intimate with the story of DeLizza and Elster and its founders, employees, customers and creations. One will learn about starting a business, running it in good times and in bad, and will gain some wonderful experiences and insights. Through the Great Depression, the war years, and industry developments such as unions, environmental issues and foreign imports, Mr. DeLizza�s story gives a comprehensive picture of the costume jewelry industry in the twentieth century. If you�ve ever been curious about how costume jewelry is designed, manufactured and marketed, you�ll revel in the fabulous details found in �Memoirs.� Of special value, this book presents a treasure-trove of information about fashion jewelry trends over time. When were clear rhinestones favored over ones in colors? When did the trend switch to smaller-sized jewelry over more substantial pieces and then back again? How and why did chain become such a key material for costume jewelry? Reading �Memoirs,� you�ll find the answers to these questions and many, many more. In a nutshell, Frank DeLizza�s book has something for everyone. It is a pleasure to read and will be a valuable resource for all of us in the years to come. Bravo, Mr. DeLizza, and heartfelt thanks for creating this masterpiece!